Regular readers will know that after a couple of days in Singapore I was off to Oslo for what turned out to be an incomparable few days. There to attend the Parabere Forum, two days of thought-provoking, moving, inclusive and wonderful speeches, conversations, workshops and camararderie. 400 women and some men from around the world, coming together to support women in food. 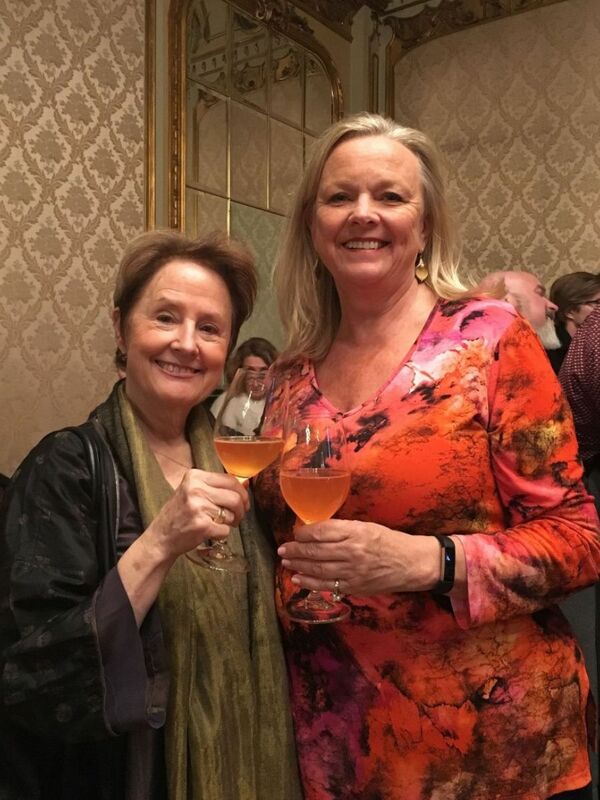 We heard from such gastronomic legends as Alice Waters, champion of local sustainable agriculture for over four decades and founder of the Edible Schoolyard Project, which advocates for a free school lunch for all children and a sustainable food curriculum in every public school. A precursor to Stephanie Alexander’s Kitchen Garden Foundation in Australia. From Dominique Crenn from 3 Michelin-starred Atelier Crenn in San Francisco, Hélène Darroze with 2 Michelin stars and three restaurants, Andoni Aduriz, male chef at the acclaimed Basque restaurant Mugaritz and our own Kylie Kwong. However some of the most moving presentations came from the likes of 21 year old Ellen Sarah Sparrok who is a Reindeer herder in Norway, Colin Harmon who set up ethical 3fe Coffee in Ireland, and a fabulous tale by Alice Quillet on setting up Ten Belles bread in Paris. Ragnild Slettner from Mestringsguiden spoke of her incredible social enterprise, empowering immigrants to set up food stalls to sell their national food and so become financially independent. Inspirational and a wonderful model for the rest of the world to follow. 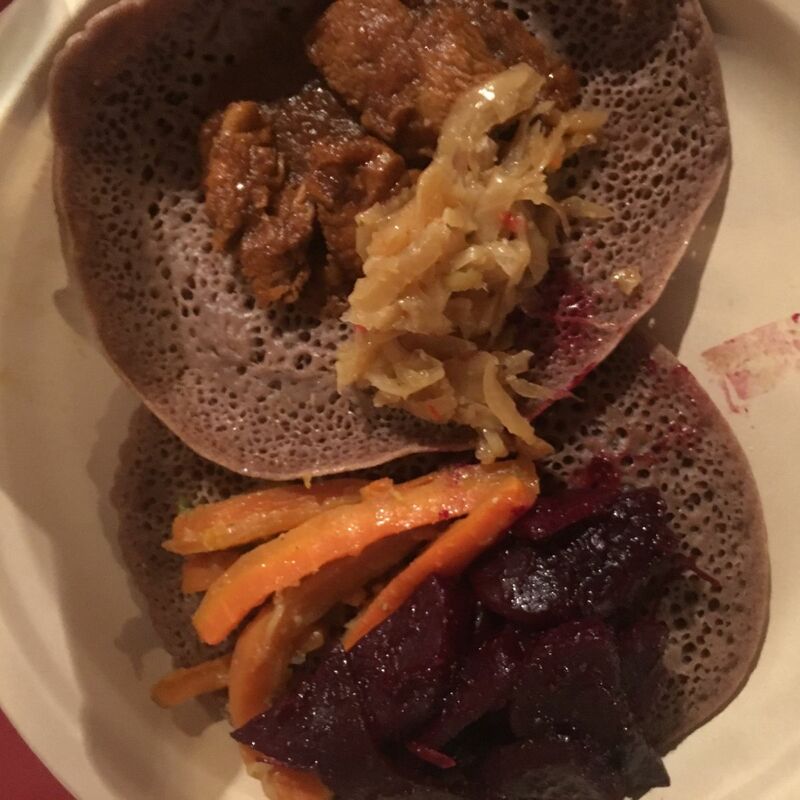 Because of this, for lunch one day we were able to sample injera or sourdough pancakes made with an Ehtiopian grain called teff, with wonderful vegetable stews the food from a group of women from Eritrea. 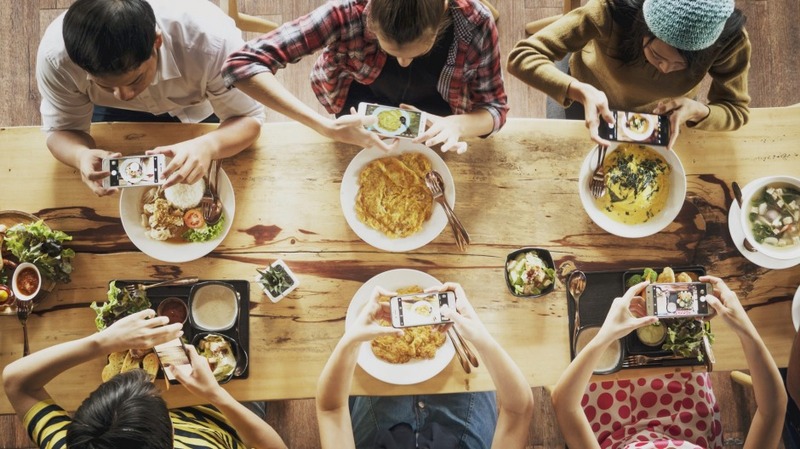 My friend Xanthe Clay wrote this article in The Sunday Telegraph in the UK entitled Does the food world have a toxic attitude towards women – and can female-focused conferences change anything? You can register online for free and read the whole article. Put grapes on your shopping list as the range and quality are superb. With over a dozen different varieties to select from including seeded and seedless varieties, juicy grapes are at their best eating in autumn. 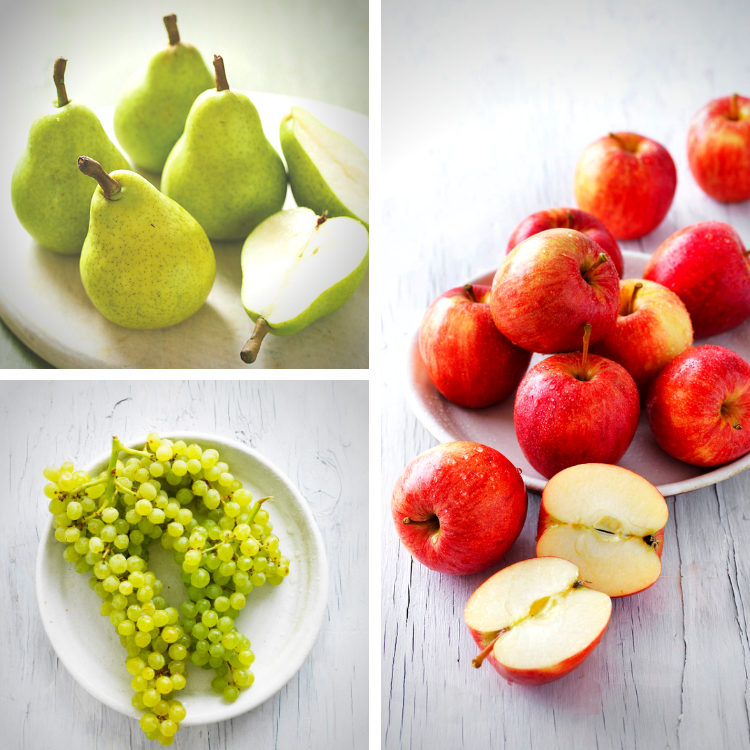 With their sweet, tender and juicy flesh, pears are an autumn delight! To ripen pears, leave at room temperature for 3-5 days. Select from Williams, Packham and Corella pears. Serve pears poached, add wedges to salads or enjoy sliced pears with low-fat cheese. You will love these Pear & muesli muffins. Smooth, creamy with a nutty flavour Shepard avocados are a top buy. A good source of vitamin B6, this vitamin has many functions and is especially important during exercise when it plays a role in changing amino acids into glucose to provide energy to the muscles. For a truly tropical treat, discover the flavour of mangosteens. A purple fibrous shell, topped with a short stem and leaf-like calyx encases the edible flesh. The creamy white flesh is segmented and tastes similar to fruit salad. Custard apples are in season. Select firm, well-shaped custard apples with dull green skin. Ripen firm fruit at room temperate for 2-3 days until fruit yields to gentle pressure. Enjoy their creamy sweet flavour teamed with passionfruit, oranges, pineapples and kiwifruit. Sweet persimmon also known as Fuji fruit is a non-astringent persimmon the most popular variety being the Fuyu. Select smooth, glossy, bright-coloured orange fruit. Like an apple, sweet persimmon can be eaten firm and crisp, however, you can also leave at room temperature to soften. Whilst apples are available year-round, the harvesting of the major varieties takes place between March and May. This month is the perfect time to enjoy new season, Royal Gala, Granny Smith, Kanzi, Mi, Golden delicious, Jonathon, Fuji and Pink Lady apples. Autumn is the time to discover the aromatic and flavoursome guavas. Their vibrant pink flesh when ripe has a granular yet creamy texture. Peel, cut in half and remove seeds, enjoy added to fruit salad, poach, juice or turn in to jelly. Chestnut season has started and you would be nuts not to try them. Cooked chestnuts have a sweet, taste and a texture similar to roast sweet potato. Chestnuts are easily boiled, baked, grilled or roasted. Pick up a kilo and enjoy chestnuts in soups, stir-fries, pasta dishes or make a creamy chestnut dessert. I focussed on chestnuts in last week’s March newsletter. Roast pumpkin is delicious and served hot or cold. Roast pumpkin with the skin on or off it’s a personal choice, but try sprinkling it with fresh herbs, Moroccan spice mix or combination of chilli and garlic embellish pumpkins, natural sweetness. Jap, butternut and Jarrahdale pumpkins are plentiful. Leeks are superb sautéed and used in egg-based dishes like quiche and frittata, they add a lovely sweetness to soups, casseroles, pies and vegetable dishes. Vibrant eggplant comes in many shapes and sizes, so versatile, this mild tasting veggie is the perfect addition to a variety of cold and cold autumn dishes because it readily absorbs flavour and becomes very tender once cooked. Eggplant is delicious any way you try it barbecued, roasted, grilled or fried. Try eggplant, lime and tofu laksa for something different. Medium to large sized zucchinis are well supplied and great value. Zucchini’s mild flavour makes them extremely versatile. Grated zucchini is ideal for adding to risotto, rissoles, meatloaf, pasta dishes and zucchini, parmesan and basil frittatas or use them in a delicious cake like this spinach and zucchini chocolate cake. Lively, leafy Asian greens add flavour, colour and crunch to stir-fries. Make the most of the quality selection on offer very reasonably priced. Kale is a super nutritious leafy green that is delicious and easy to prepare. Crisp and crunchy the leaves are loaded with antioxidants, vitamins and iron. Toss trimmed leaves into stir-fries, soups, delicious roasted or sautéed..
Mushroom offers flavour, value and convenience. Rich in B group vitamins and fibre, mushrooms are nutritious, delicious and a thrifty buy. Try this Leek, mushroom & baby spinach risotto. 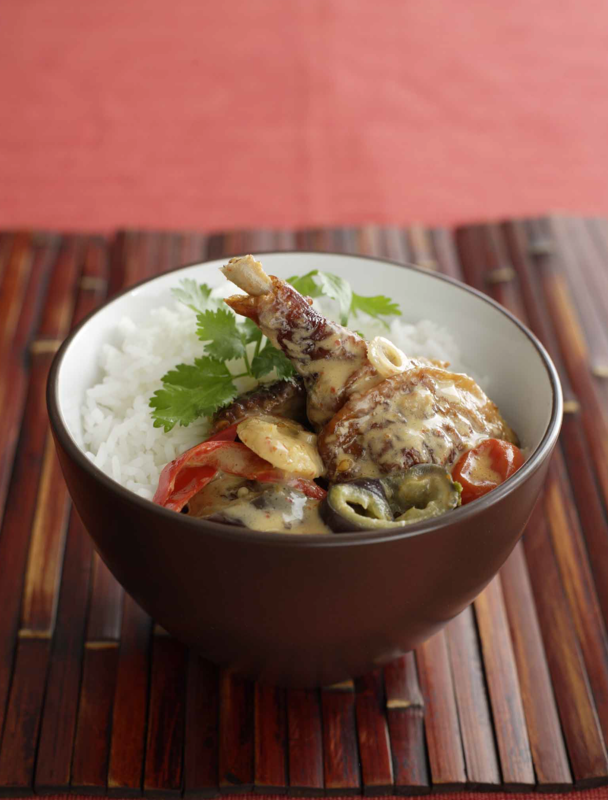 Scoop the thick cream from the top of the coconut milk and heat it in a wok or frypan with the lemon grass, curry paste, chilli and kaffir lime leaves. Simmer for 10 minutes. Meanwhile remove the breasts from the duck and chop into four. Remove the legs and chop into two. Remove any other meat and delicious skin from the duck too. Add the duck and remaining coconut milk. Return to the boil and add vegetables. Cook over medium heat for 5-10 minutes until vegetables are cooked. Season with fish sauce and sugar. Taste to see if more chilli, sugar or fish sauce is needed. Add coriander or basil and serve with jasmine rice. Lyndey’s Note: Chinese BBQ ducks can be bought in Asian stores or from Chinese restaurants. Make sure you ask for whole duck and not chopped up, having them chopped up can lead to little bones getting into the curry. This dish goes beautifully with a nice full bodied Shiraz. Recipe from Balance. Matching Food and Wine. What Works and Why by Lyndey Milan and Colin Corney. Also sometimes known as Lebanese eggplant, this long, slender, finger-shaped variety can range in colour from dark purple to striated shades. They have a tender and sweet taste. Also known as Kermit eggplant, this variety is the size of a golf ball and features white/mauve skin with some green mottling. It is often used in red curries. Used in Thai and Indonesian cooking, these tiny, pea-shaped eggplants come in clusters. Light green in colour, they have a bitter taste and many seeds. Available from Asian greengrocers. Look for a firm, glossy-skin eggplant that is heavy for its size with a bright, mould-free top. Younger, smaller eggplants are usually less bitter than larger or older ones. Store them whole in the refrigerator for up to 5 days. To salt or not to salt? While this isn’t essential, it does help tame the bitter taste, especially of older eggplants, by bringing out the juices and letting them drain. Lay slices or cubes on layered paper towels and sprinkle all sides with salt. Top with more paper towels and a plate or something to weight them down. Let stand about 20 minutes, then rinse, pat dry, and use as desired. 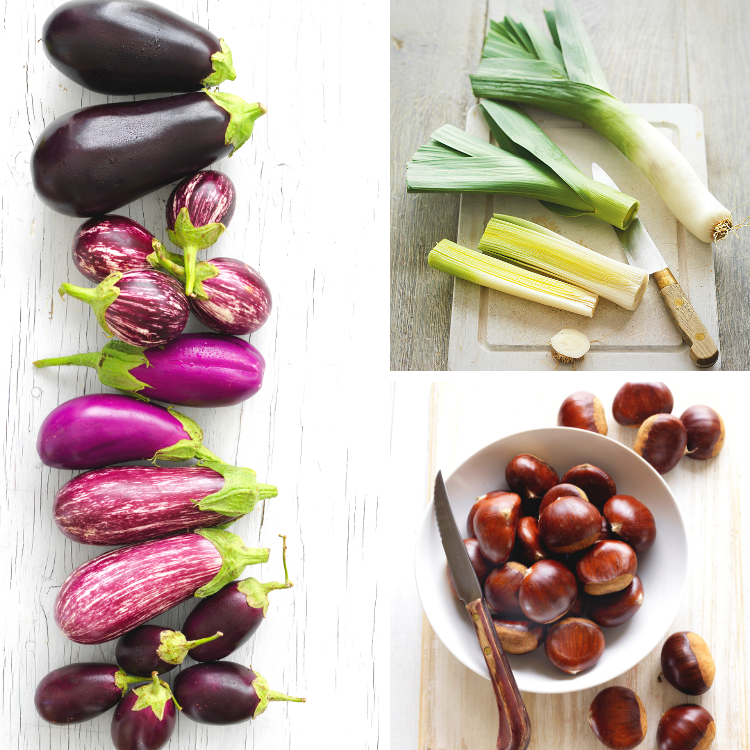 Read why purple coloured foods are so good for us in The power of purple. Because eggplant is so hearty, it makes an ideal meat substitute or side dish. It is very versatile and can be cooked in so many ways including grilled, roasted, fried, microwaved, stewed and even boiled. (I do this before making an eggplant sauce for pasta and it drastically reduces the amount of oil they absorb.) Soft and silky or smoky and full-bodied, they are a star ingredient in many cuisines. 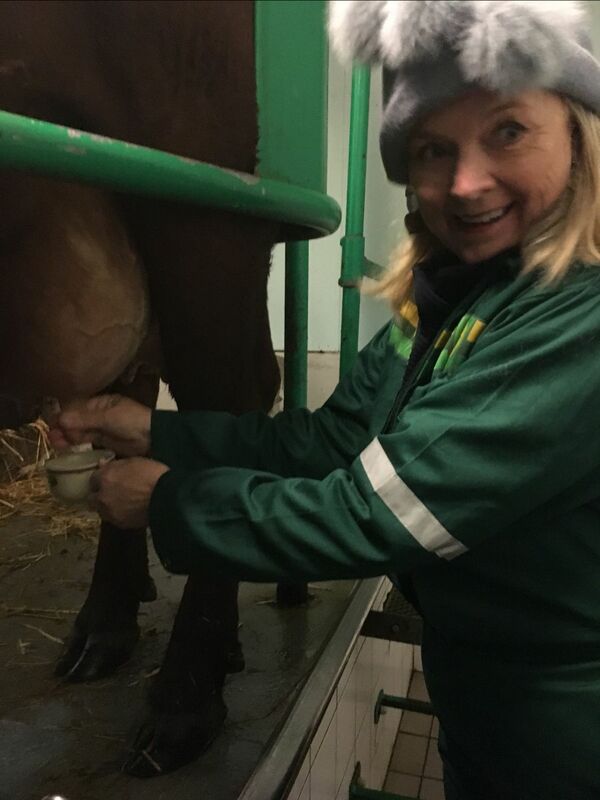 Milking a Norwegian Red cow – note the hat, it was snowing outside! 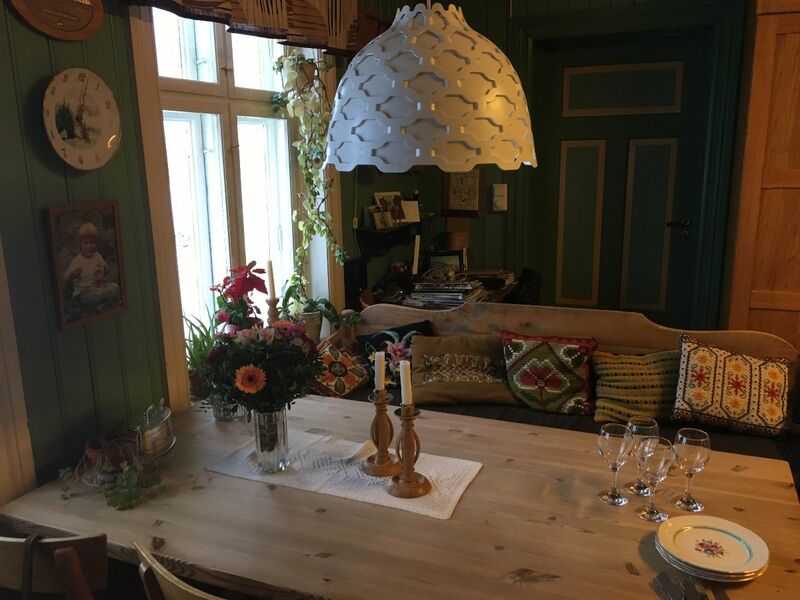 Up Norway is a small company of true insiders who suggest, plan, and book trips for guests who seek quality and one of a kind experiences all over Norway. Their main goal is to give exclusive access to special experiences, through a custom made itinerary based upon personal preferences. 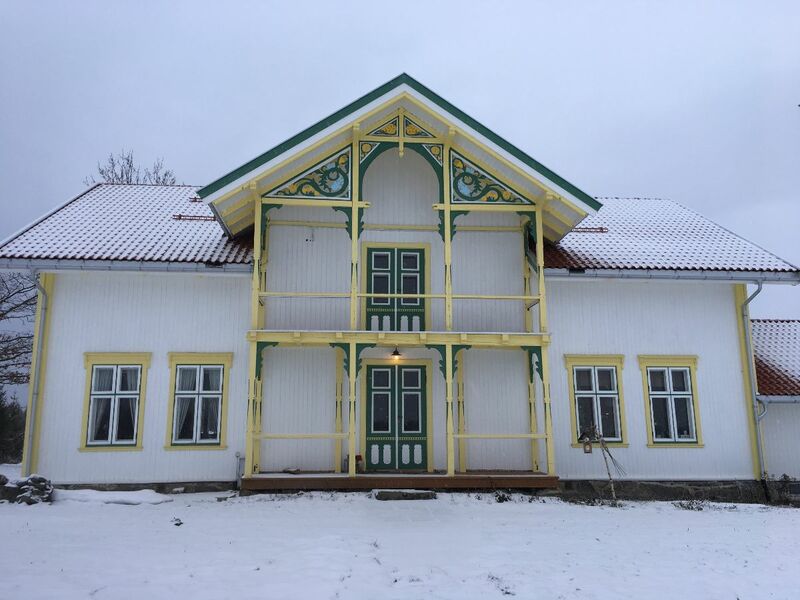 My tour promised: take part in afternoon milking and taste products from the dairy, while learning about eco farming and small scale food production in Norway. Follow the produce all the way to the table at a selected Oslo restaurant, where you will enjoy a multi course dinner with local organic ingredients, including produce from Grøndalen. This includes all transport. It was nothing short of sensational. The farmer Hans Arild was unwell but his son Lars Kristian, and wife and Anne Birthe stepped into the breach admirably. The small 35 acre farm is completely organic, with no use of antibiotics and they have only 13 cows, which is their legal quota, but as Anne explained, because of their careful animal husbandry, it gives them a living. The land has been in the family since the 1600s but has been farmed since Viking times. Norwegian law meant it was passed down to the oldest male in the family, but since 1967 it goes to the firstborn, if they want it. Lars is the second son, but the one who works the farm. The breed, Norwegian red, comes from a mixture of old Norwegian breeds and each cow has a name. They are sold after six or seven years as milkers, and restaurants often feature their names on their menus. This also happens with male calves which are slaughtered at 6 months, but may be sold, a restaurant committing to one before they are even born. Cows calve about once per year, throughout the year, to maintain milk production, but about 10 years ago Anne suggested that they keep the calves with the cows for two months after birth, by which time they have also been taught how to eat hay by their mothers. This is something new for a dairy farm where usually the separation is immediate. They say they could immediately see a positive response from the cows who are bright eyed and happy. They still milk the mother cow, but only taking what milk the calf doesn’t need. There is always enough for the calf and we even saw how one cow when being milked hung on to the milk in part of her udder, preserving it for her calf. The cows can wander inside the barn or outside at will, the straw inside being changed daily and then used on the fields. The cows line up voluntarily to be milked and we see Isrosa whose milk goes entirely to the 3 Michelin-starred restaurant Maemo. The rest is blended and goes to the Co-op which the farmers co-own. It takes two hours, twice a day to wash the cows udders and milk them. It is a gentle process with each cow giving about ten litres at each milking. The milk is tested and if it is not up to their extremely high standard, it is fed to the calves. Next we donned protective clothing in the factory where we saw where their cheese, called Nyr has been made for the last 8 – 10 years. It is a fresh curd cheese made in 300 litre batches. The milk is pasteurised, then soured with milk acid bacteria without any rennet. 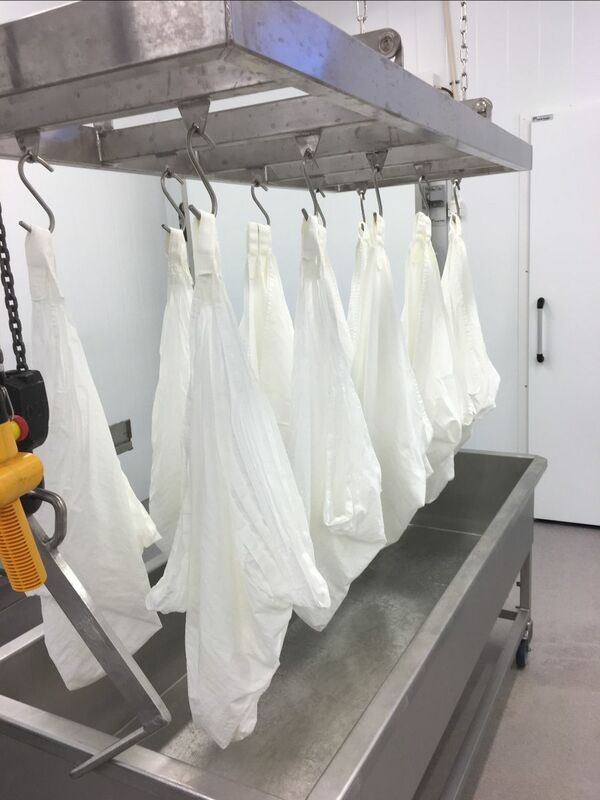 It is then put into huge bags for the whey to drain away overnight. 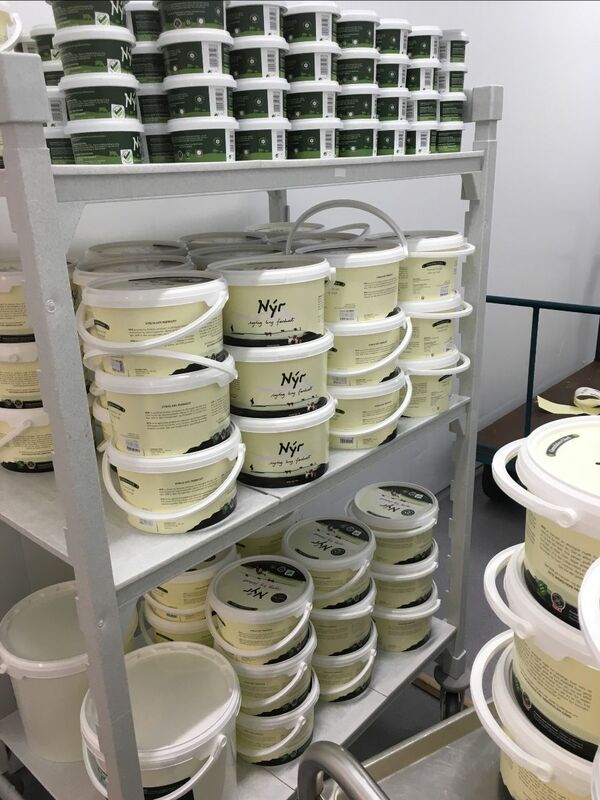 The remainder is stirred slowly and put into different sized containers for restaurants and some supermarkets. Demand has built up and from making cheese only one to three times per month, now it is two to three times per week. Some chefs use the whey too. Finally we went to their charming 1902 farm house where we tasted the milk and the Nyr, presented in various ways. 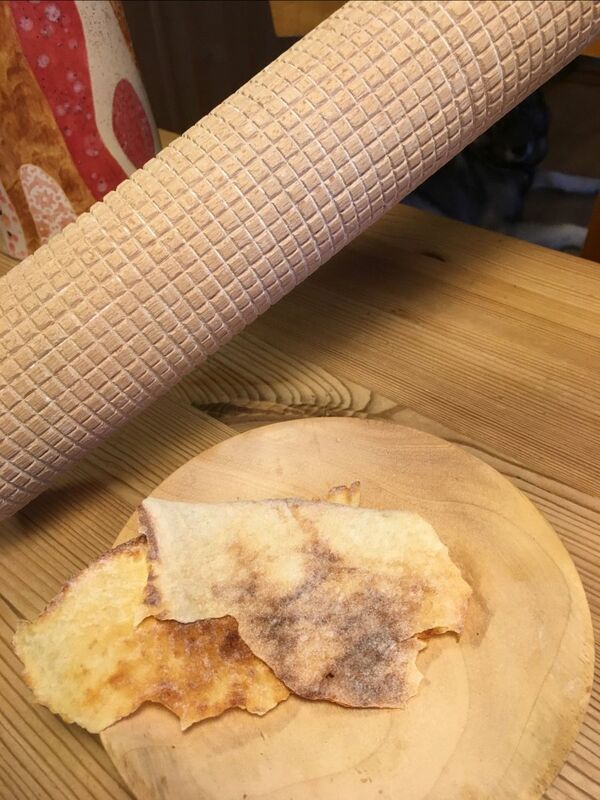 Anne had made traditional potato flatbread with a faint pattern from the rolling pin used. We tasted the Nyr on its own, with a lovely texture like thick yoghurt and an appealing sourness. 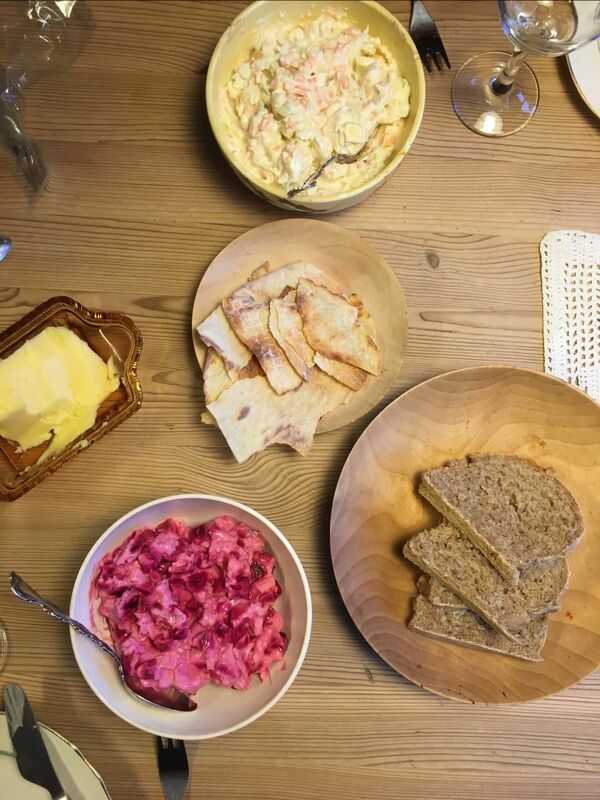 Anne had also made bread, a coleslaw with horseradish and Nyr, mixed it with diced beetroot and we also had it slightly sweetned in a glass layered with raspberries and golden cloudberries, drizzled with honey and nuts. 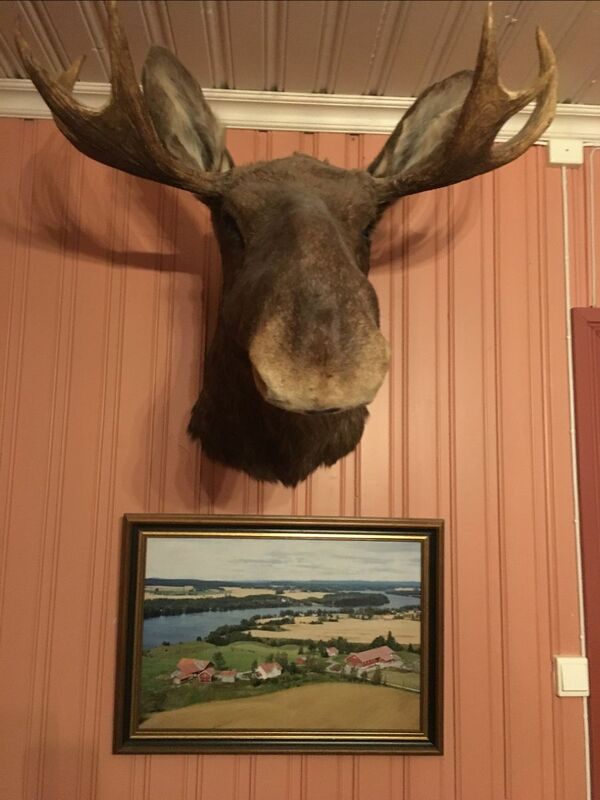 It was also a thrill to see their beautiful traditional home full of handcrafts and woodwork with a moosehead on the wall. There is a trophy for them having the highest quality milk for 19 out of the last 20 years. Such a very special and privileged experience. When my companions and I left it was snowing reinforcing the magic we experienced. Next week I will report on the amazing dinner which followed. However, for someone who has been to many farms both in Australia and around the world when filming my TV series, this experience was something else. Farmers are all special people and this family moved me with their honesty, authenticity and sincerity. 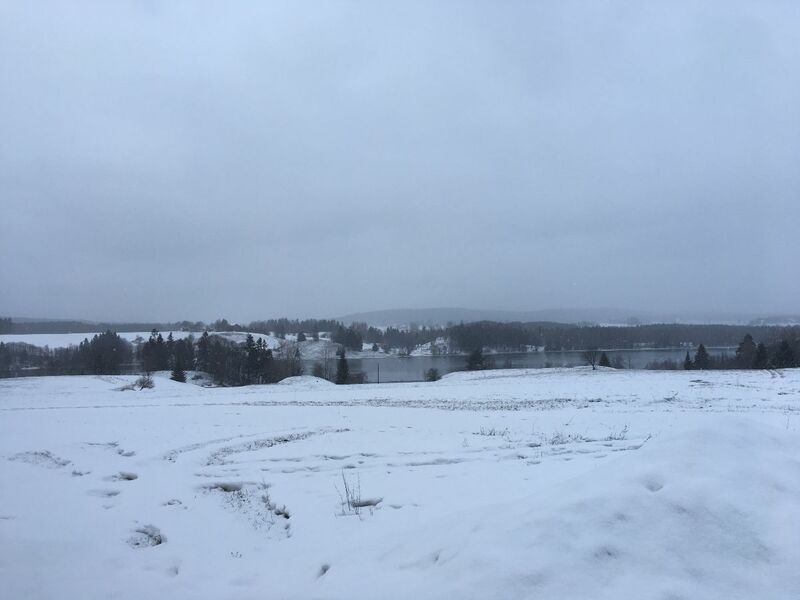 The extraordinary landscape of Norway in the snow made it an experience I will never forget. The great thing is that this was not just me being priveledged for filming, though I have been on many, many farms in other ways over the years, this is an experience which anyone can enjoy through the wonderful work of Up Norway. There are innumerable bespoke experiences on their website. I commend them to you. A great piece in the Financial Review on How drought conditions are changing Australia’s fine dining menu . 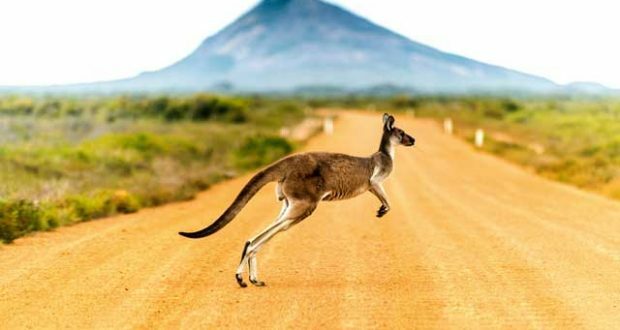 Agriculture in Australia is hard and hopefully this might make consumers more aware. This piece in Good Food Diners behaving badly: Mind your modern table manners also hit a chord. It is sad so many people obsessed by food are afraid of it. Here’s a heartfelt piece Full up: falling back in love with food and joyful eating. Four of Australia’s most prominent female winemakers have joined forced to create a Shiraz label helping to promote other women in the industry. Hear me roar (named after the Helen Reddy 1971 song) — a wine made from Shiraz grapes harvested in Southern Australian regions Eden Valley, Barossa Valley, McLaren Vale & Coonawarra — is the fruit of a collaboration between Sue Hodder of Wynns Coonawarra Estate, Emma Norbiato from Calabria Family Wines, Irvine Wines’ Rebekah Richardson, and Corrina Wright of Oliver’s Taranga. Proceeds from its sale will go towards scholarships and mentoring programs and professional development for women in the Australian wine industry. Hopeful candidates will be able to register for the courses in June this year. $180 per half dozen (maximim purchase) from Irvine Wines online. 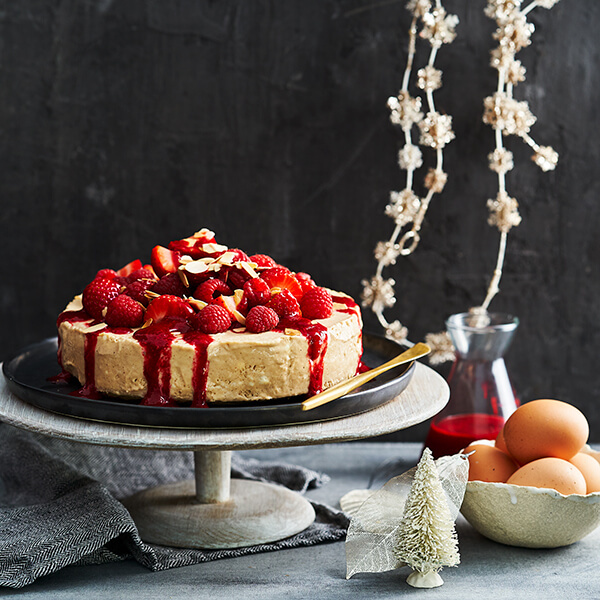 Under the auspices of Michele Chevally Hedge’s Healthy View, Nutritionist and Holistic Chefs, Sara & Sim will teach easy baking for the time poor cook. Suitable for adults and children over 8 years old. Cakes, Savoury Muffins, Sweet Muffins with hidden treasure, Muesli Bars, Bliss Balls, Mexican Quesadillas and Protein Packed Pizza will be made and sampled. Full guide to cooking with gluten free flours. What to use and when. COST: $165 per person. 10% discount if you bring a friend on both tickets. 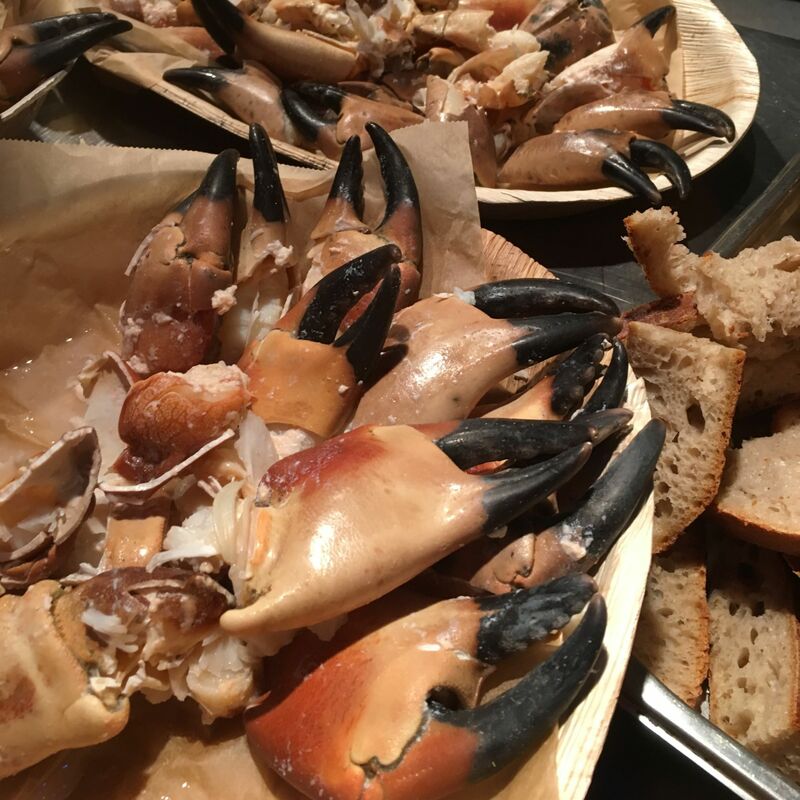 Saturday: oyster tastings and experiences with cooking demonstrations, oyster shucking and tours. Tickets from $20 – $160 here. The very best of the High Country’s food and drinks will be showcased in a packed program that will celebrate both the outstanding natural beauty of the mountains, valleys, vineyards and villages of the region and the incredibly talented folk who bring it to the table. There are more than 40 delicious events at cellar doors, village cafes, hatted restaurants, amongst the vines and by the light of blazing bonfires from Mansfield to the King Valley, Beechworth to Bright, Rutherglen to Mount Beauty, Corryong to Falls Creek. Highlights of this year’s Feast Festival program around the region include: Patrizia’s Harvest Forage with Patrizia Simone; Fermentation Degustation: Bridge Road Brewers Beechworth founders Ben and Maria Kraus; 50th anniversary of Delatite Wines, including a five course degustation dinner paired with some very special wines from the depths of the cellar; Lunch With Three Italians at Pizzini Wines in the King Valley. ; The Tweed Ride in Rutherglen, where the theme is vintage – clothes, bicycles and wines and the easy pedal includes outstanding food and wine experiences along the way including lunch at Stanton & Killeen. 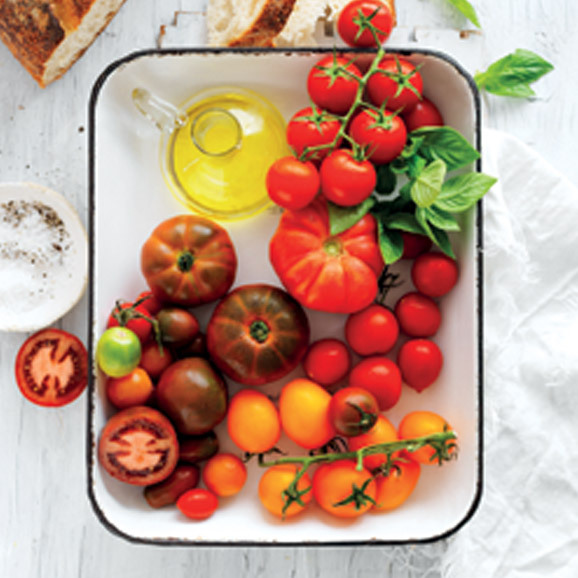 Before tomatoes go out of season in Australia, Pure Wow explains 6 Different types of tomatoes and how to use them. Food and Wine shares 10 dishes every beginner cook should master. You can tell this is American by the inclusion of marshmallows – hardly an essential in my mind. I’ve always thought about doing a book Recipes to Leave Home With but haven’t done so yet. 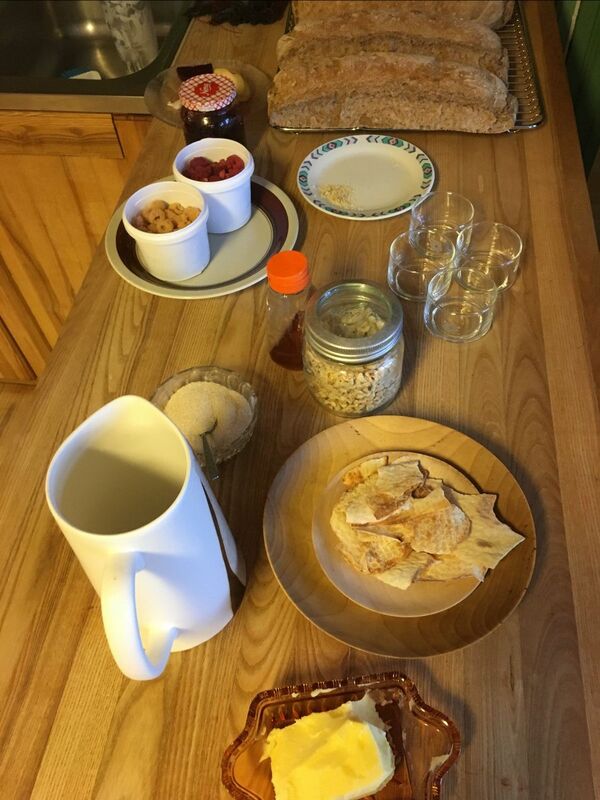 It is so important that everyone knows how to look after themselves, even with simple recipes, so we are not dependent on takeaway food or restaurants and use them as matter of choice and not necessity.